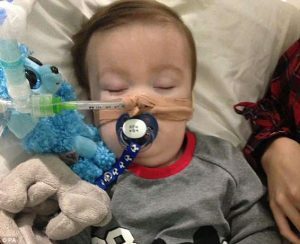 BACKGROUND: According to standard news accounts, Alfie Evans was comatose for well over a year after being struck down with a degenerative illness, theorized to be Mitochondrial DNA Depletion Syndrome (MDS). The 23-month-old, having missed many developmental milestones in his first seven months, started making seizure-like movements and was taken to the doctors. But his parents were told he was a “lazy, late developer.” Alfie caught a chest infection that caused seizures and was placed on life support at Alder Hey Children’s Hospital in Liverpool in December 2016. His life support was turned off on April 23, 2018, after a last-ditch bid by his parents to save his life was rejected. Yet, he didn’t pass away until five days later at 2:30 a.m. on April 28, 2018. Parents Tom Evans and Kate James broke the news to the “Alfie’s Army” supporters on Facebook, saying: “Our baby boy grew his wings tonight at 2:30 a.m. We are heartbroken.” The parents, their pleas to save Alfie’s life having been rejected by the UK and European courts, remarked that the decision to pull the plug meant their son was “about to be murdered.” They had taken their battle to the Supreme Court after the Court of Appeal agreed with Alder Hey that Alfie “could not be saved” and that it would be “unkind” and “futile” to continue treatment, but their bid was dismissed. 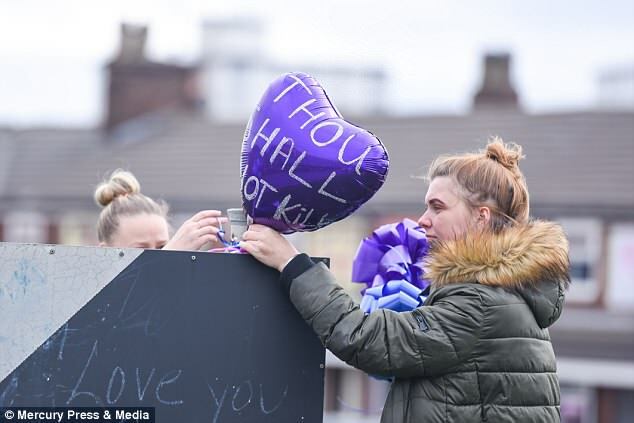 The state-sanctioned death of little Alfie Evans brings with it a wholly new realization regarding the people’s relationship with the almighty state. To begin with, the British government didn’t make a “mistake” in paving the way for Alfie’s death. It was not bureaucratic bungling. It was not an oversight. He was not mercifully “allowed” to die because he stood no chance of living. Rather—and this is where the real shock and pain lies—his life was aborted, and his death assured, via state decree PRECISELY WHEN HE SHOWED BETTER-THAN-EVER SIGNS OF LIVING. This, despite the Vatican having offered to cover all transportation and treatment costs for Alfie at its hospital, a solution which Alfie’s shattered father pushed for with all his might. Italy even gave Alfie citizenship, for God’s sake. But the British “medical” apparatus and courts told the father, in effect, to piss off, as it’d rather save face than save a life while adhering to the pathetic conventional “allopathic” medical system, larded as it is with risky vaccines, dangerous drugs, often needless surgeries and a notable hostility toward natural healing and the role of religious faith in human health. Still, it gets worse: British police formed a line to prevent the protestors from doing anything more to save Alfie after some of the child’s supporters tried to storm the hospital in protest. But while the police line was challenged but not crossed, a different “line” was crossed—a line that we didn’t see. State-sponsored treachery being what it is in an age of killer drones and endless wars, it’s not that what happened to Alfie is altogether surprising, profoundly shocking though it certainly is. It’s just that many of us probably had assumed that, deep down, some fragment of moral sense perhaps still animated the UK government and the Crown. But we were wrong. Dead wrong. Thus, Alfie’s short, difficult life and its passing took all of us past the proverbial Rubicon—into an even deeper abyss than we could have imagined, allowing us to finally find the absolute bottom. At long last, this gives us a crystal-clear glimpse into the nature of the deep state with its mask fully removed. To call it horrifying fails. Dreadful? Mortifying? Those descriptors also fall short. So, while words fail, so, too, did every Lord, every MP, PM Teresa May, the Queen and the entirety of the British establishment, including its vaunted health-care system. But here again, “failure” implies an attempt that didn’t work out, or maybe indifference. What we’re looking at, rather, is the intentional killing of a defenseless toddler at the hands of the state. Alfie could have been hung in the town square. Instead he was hung out to dry. This was malice—of a degree heretofore unknown. An act of hate by the state against the common man. If this child had had even a molecule of “blue blood,” he would have been treated much differently. And, in a sense, this barbarity even transcends that of the abortion clinic, where children are ripped to pieces in an arrangement where the state spends tax dollars regardless of the fact that some taxpayers disagree with terminating pregnancy on demand. However, what really happens is that murder—through language distortion via media and government propaganda—is disguised and given sanctuary as just another “choice,” like which toothpaste to purchase. But Alfie’s parents were given no choice whatsoever, even when they had the best of all possible options in the Vatican’s offer and Italy’s granting of citizenship. Dare we speculate whether the British state used Alfie’s plight to test the public’s resolve, but then blocked whatever physical response took place to frustrate the last remaining impulse to rescue the tot? Was that the tactic? To exploit the emotional moment and reassert state tyranny no matter how dire the outcome, to crush the people’s morale and finish off the moral framework that makes civilized life possible? Could the UK’s central state be that depraved, even when another state, Italy, had given the UK an “out”? Have the ethical “goalposts” therefore been moved in the state’s favor? If so, can we regain the lost ground? Amid such questions, we do know that if Britain’s “authorities” wouldn’t even release Alfie to the Vatican —just to see what happens, since Alfie was improving and clung to life for about five days after “they” pulled the plug on him—then absolutely no one’s life is safe, much less sovereign or sacred. Infant, toddler, twenty-something, middle-aged, elderly: Our lives are negotiable instruments, mere collateral for national debts and fodder for wars. Yet, distant though it may seem, there’s a silver lining. In a Christ-like way, little Alfie died, if providence be with us, not to save our souls per se, but to shine a blinding light on our political cowardice and our willful denial of the reality that our “governments” are controlled by a financial coterie and inhabited by toadies who simply keep the wheel turning so the taxman can collect revenue for the bankers to receive their interest payments. So, perhaps we all should say, thank you, Alfie, for showing us what we’re truly up against. May we be worthy of your fate, young lad, and finally unify to tell the state, in no uncertain terms, that no child belongs, or will ever belong, to the UK government, nor to any other government. Governments that wear the labels “democracy” or “republic” must always belong to the people. If they don’t, they’re just an official mafia. Therefore, the “governments” of the world, starting with the UK’s, need to level with us about where we really stand in relation to them. Just once in their cryptic lives, they need to tell the whole truth about they, the governors and we, the governed. We also might ask our illustrious “leaders” whether there’s any meaning, any meaning whatsoever, to our political existence? Is there even a trace of substance to our constitutional rights, even the basic right to live? Or not?